Abuja, Nigeria. September 8th 2015 – Today marks the celebration of this year’s International Literacy Day. This calls for reflection on the state of the Nigerian educational system, with a special focus on child education; given that about 10.5 million Nigerian children are out of school, according to a report released by UNESCO in 2013 and recently reiterated by the Country Director, United Nations International Children’s Fund, Jean Gough. This recent revelation is supported by a poll conducted by NOIPolls Limited in 2013 which revealed that about 8 in 10 Nigerians (78%) observe children out of school in their localities each day. Also, the poll revealed that almost 6 in 10 (57%) Nigerians supported the claim made by UNESCO that Nigeria has the highest number of children out of school. Children out of school are school-age children not enrolled in primary or secondary school. The UNESCO Education for All Global Monitoring Report released in June 2013 states that Nigeria holds the world record of having the highest number of its young people out of school. With approximately 10.5 million kids out of school, Nigeria tops the table of 12 other countries with which it accounts for 47 per cent of the global out-of-school population. Forty per cent of Nigerian children aged 6-11 do not attend any primary school with the Northern region recording the lowest school attendance rate in the country, particularly for girls. Despite a significant increase in net enrollment rates in recent years, it is estimated that about 4.7 million children of primary school age are still not in school. The compulsory, free Universal Basic Education (UBE) Act was passed into law in 2004 and represents the Government’s strategy to fight illiteracy and extend basic education opportunities to all children in the country. However the number of schools, facilities and teachers available for basic education remain inadequate for the eligible number of children and youths; this is more pronounced in urban areas. It is not rare to see 100 pupils per teacher in some public schools. Under these conditions, teaching and learning cannot be effective; hence the outcomes are usually below expectation. Against this background, NOI Polls conducted its recent “Public Education” Snap Poll to seek the views of Nigerians regarding Out-of school-Children, and their opinions of possible remedies to addressing the issue of out-of-school children. Respondents to the poll were asked five specific questions. The first question sought the opinion of Nigerians regarding the recent claim made by UNESCO. Respondents were asked: To what extent do you agree or disagree with UNESCO’s claim that Nigeria has the highest number of children out of school? The overall majority (57%; 22%+37%) agree with the claim that Nigeria has the highest number of children out of school. Furthermore, 30% (2%+28%) of the respondents are not in agreement with this assertion, while 13% are neutral since they neither agree nor disagree with UNESCO’s claim. When the results are analyzed according to geo-political zones, the North-Central zone accounted for the highest proportion of respondents (38%) that strongly agree with the claim made by UNESCO that Nigeria has the highest number of children out of school. This is followed by the South-West and the South-South with 25% and 24% respectively. In addition, The North-West zone had the highest number of respondents (43%) that agree with the claim and the North-East zone accounted for the highest proportion of respondents (38%) that disagree with the assertion. Subsequently, to verify this claim, respondents were asked: Personally, during the course of your day, do you normally see children out of school in your locality? In response to this question, the overall majority (78%) confirmed that in their various localities, they usually see children out of school during the course of the day. Comparatively only 22% of the respondents answered negatively to seeing children out of school in their localities. 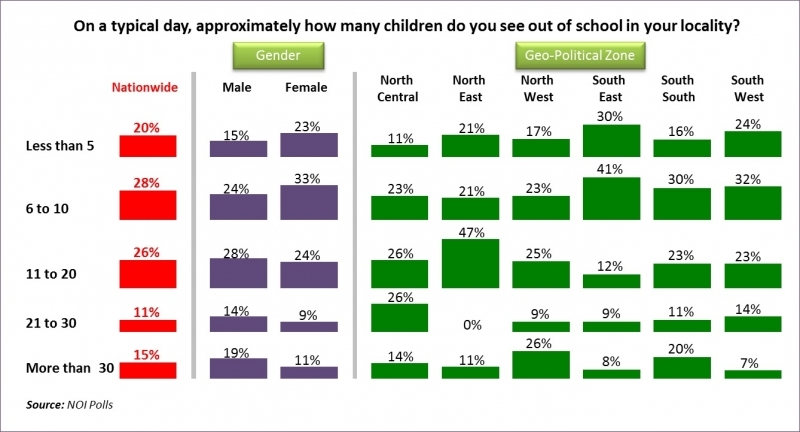 From the geo-political zones perspective, the North-West zone and North-East zones both had the same and highest proportions of respondents (83%) who are positive to seeing children out of school in their localities during the course of the day. This is followed by the North-Central zone with 79% and the South-South zone with 77%. In addition, the South-East zone accounted for the highest number of respondents (30%) that answered negatively to seeing children that should be in school on the streets in their various localities. Furthermore, in order to gain insight on the number of children seen out of school, respondents who claimed to see children out of school in their localities (78% of the total) were further asked: On a typical day, approximately how many children do you see out of school in your locality? The findings are shocking, as majority (28%) of respondents claimed they see about 6 to 10 children out of school on a typical day. This is closely followed by 26% that claim to observe about 11 to 20 children out of school each day. Furthermore, 20% of the respondents stated that they observe less than 5 children, 15% say more than 30 children, and 11% claim about 21 to 30 children are seen out of school in their respective neighborhoods. Further analysis across geo-political zones shows that while the South-East zone had the highest proportion of respondents (41%) that confirmed seeing between 6 to 10 children that are not in school within their localities, it also accounted for the highest proportion of respondents (30%) that see less than 5 children on the streets. The North-East zone had the highest proportion of respondents (47%) that confirmed seeing between 11 to 20 children out of school. Furthermore, the North-West zone accounted for the highest proportion of respondents (26%) that see more than 30 children out of school and the North-Central zone had the highest proportion of respondents (26%) that see between 21 to 30 children on the streets instead of in school. These findings are alarming and they call for urgent attention. The fourth question sought the views of Nigerians regarding the current state of the public educational system:In your opinion, how would you rate the public education system in Nigeria?The overall majority 45% (43% + 2%) rated the Nigerian educational system good, compared with 35% (24% +11%) who rated the educational system as poor. Furthermore, 20% are neutral rating the Nigerian educational system neither good nor poor. From the geo-political standpoint, the findings show that the North-East zone accounted for the highest proportion of respondents (70%) that rate the Nigerian educational system as good. While the North-West zone had the highest proportion of respondents (40%) that say the educational system is poor, the South-South zone accounted for the highest proportion of respondents (19%) that says the educational system is very poor. Finally, in order seek public opinion on how the Nigerian educational system can be improved, respondents were asked: What suggestions do you have to reform the public education system and keep more Nigerian children in school? The overall majority (37%) suggested that in order to improve the Nigerian educational system and reduce the number of children out of school, government should “provide free education system”. In addition, 30% of respondents were of the opinion that steps should be taken to “employ qualified teachers and motivate them”. Some other respondents (19%) suggested that “Government should equip the schools”, while 10% think “Government should build more schools”. Also 3% suggested that more public awareness be created on the importance of education. In conclusion, the results from this current poll have revealed that the majority of Nigerians (57%) support the claim by UNESCO that Nigeria has the highest number of children out of school. This is particularly evident considering the fact that the overall majority (78%) witness children out of school during the course of a normal day. Furthermore, the majority of respondents claimed to see as many as 6 to 10 children who should be in school hanging around their locality during school hours. However, the slight majority (45%) gave a good rating to the Public Education system in Nigeria even though there is obviously room for improvement considering the number of children currently out of school. Suggestions to improve the public education system include the provision of free education, the employment & motivation of qualified teachers, building & equipping more schools, as well as creating more public enlightenment on the importance of education. Finally, these findings call for urgent attention in the public education sector. Considering the significance of education in the economic growth and development of any nation, urgent measures need be taken to reform the public education system in Nigeria, and to keep more children in school. After all Children are said to be the leaders of tomorrow.